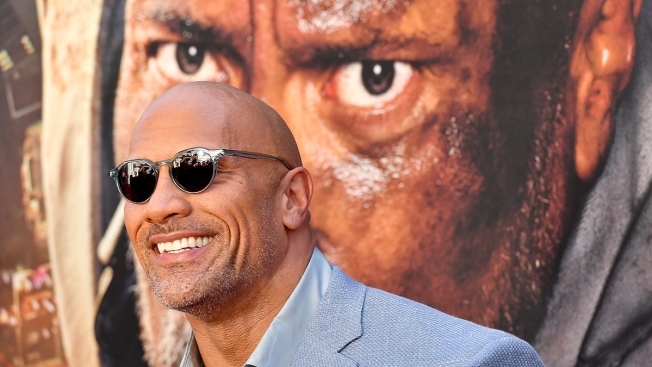 In this July 10, 2018 file photo, Dwayne Johnson attends the 'Skyscraper' premiere at AMC Loews Lincoln Square in New York City. While working with the Make-A-Wish Foundation, Rays of Sunshine Children's Charity and Starlight Children's Foundation, the action star gave three unsuspecting kids — 9-year-old P.J., 11-year-old Cameron and 6-year-old Lucy — an unforgettable surprise on the set of his upcoming action film, "Hobbs & Shaw." The three youngsters were shocked and excited when Johnson came out to meet them in person and, with some help from The Rock's phone, Lucy even demonstrated her love of "Moana" by singing "How Far I'll Go" for the star. The surprises continued as co-star Jason Statham also made an appearance to meet the kids before Johnson sweetly introduced the trio to the set. No visit from The Rock would be complete without some presents, so he gifted them tons of goodies, including Dwayne Johnson sweatshirts, hats, headphones and an Xbox game pass. When P.J. informed Johnson he didn't have an Xbox, the actor had them covered with custom "Hobbs & Shaw" gaming stations. As the cherry on top, Johnson handed them each a box of his homemade cookies. Needless to say, the kids gave the experience rave reviews. "Today was absolutely incredible," Cameron said. However, it seems Johnson was the most thrilled of all. "To spend time with P.J. and Cameron and little Lucy — just to see them smile and have a great time and to bring a little bit of joy in an otherwise pretty challenging time is just very, very special," he said into the camera. "This kind of stuff is easily, easily the best part of my fame. I'm lucky."